Are you protecting your social media brand? I was followed on Twitter last night by @trynetflixfree As a long-time Netflix member, I clicked the link to determine whether I should follow back. 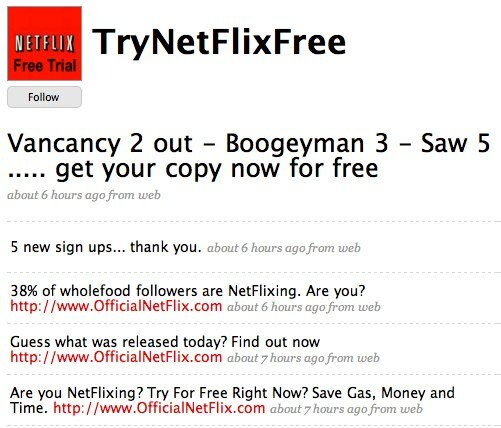 Much to my surprise, @trynetflixfree is a Netflix affiliate, trying to drive new subscribers via banal appeals on Twitter. I don’t begrudge the affiliate marketing industry. From the days that amazon.com launched its first program, affiliates have driven a major portion of the growth of e-commerce overall, and I’ve established and managed many affiliate programs for clients. But, social media is different. If you concur that the prime directives of social media involvement are authenticity and helpfulness, you cannot allow affiliates to engage in actions that run counter to that spirit. Social media is not search, where consumers expect to find multiple, similar search returns that may represent what they’re seeking or a reasonable alternative. Other than widely publicized “spoof” accounts like Shaquille O’Neal on Twitter, the expectation is that most branded social media outreach efforts are managed by the actual brand (or its agencies). 1. If you have an affiliate program, revise your rules to prohibit affiliate use of the brand name on Facebook, Twitter, YouTube, Flickr and other social media outposts. 2. Convene a conference call with your most important affiliates to discuss how they could use social media effectively without diluting the brand. 3. Conduct scheduled audits of the brand name (using some combination of Google Alerts, Twitter Search, Twingly, Radian6, Techrigy) to ensure that you discover affiliate use of the brand as quickly as possible. How else can brands make sure their social media efforts are undercut by affiliate partners?